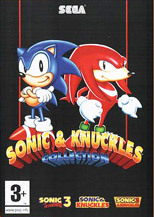 In 1997, Sonic 3 and Sonic & Knuckles made an additional appearance on the humble Windows PC with Sonic & Knuckles Collection, which was also re-released over here in Europe in 2004, for the bargain price of a fiver. 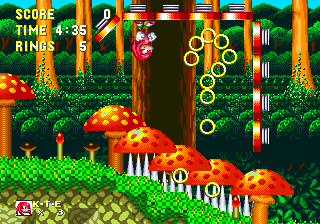 The original release also included the highly animated and functional Sonic Screensaver. This package not only contains the separate versions of Sonic 3 and Sonic & Knuckles, but also the results of combining the two, creating the ultimate game; Sonic 3 & Knuckles. Not only that but hidden in the "Game" menu on the menu bar is "Special Stage mode" which is actually the near-endless bonus game obtained from locking Sonic 1 into S&K. Four Sonic games in one, and they're all virtually identical to their original Mega Drive counterparts, except for one thing.. the music. Most of the tunes we all know and love are still present, but rather than being maintained in their original states, they have been recrafted into MIDI or FM formats. Some, however are completely absent and replaced by original compositions, including both acts of Carnival Night Zone, Icecap Zone and Launch Base Zone, plus Sonic 3's Knuckles theme and the credits music. Interestingly these are the tracks that are suspected to have been created by a certain, uncredited King of Pop (see the Sonic 3 Miscellaneous page), so there may have been legal issues in including these in this version, if indeed there's any truth to such rumours. Carnival Night is a bit more upbeat than what we're used to, dropping the slightly disjointed gimmick, but still keeping the carnival theme intact. Icecap is also quite upbeat, with slightly less of an icy feel, but I must admit to being quite fond of the alternate theme for Launch Base. It's got quite an imperial, heroic flavour to it. Either music or sound effects can be disabled. The more recent release of S&K Collection will run on Windows 95, 98, ME and XP, but not 2000 or 3.1. As for Vista, Windows 7, or anything more recent, it's anybody's guess really. Minimum requirements include a P100 Mhz processor, 16MB of system memory, a 16MB graphics card, 80MB of free hard drive space, DirectX 5, and 4x speed CD-ROM. It can be played full screen or in a small window, however for some reason it will only run stupidly fast and unplayable in windowed mode. In 2009, Sonic & Knuckles completed the Xbox Live collection of Mega Drive Sonics, downloadable on the Microsoft Xbox 360 console, now for only 240 MS points (or a free one-level demo). If you've played the other games in this "Sega Vintage Collection" series, you'll know that the title screen and demo sequence occurs only within a small window on the screen, while you select your options next to it, and rather than selecting between Sonic and Knuckles at the bottom of the title screen as normal, you can do so through this generic menu system when creating a new game. New, though, is the ability to save and load the state of the game at any time into one of three save slots via the generic menu system, and extra options include the ability to enable or disable graphic smoothing, and adjust the size and stretching of the game on the screen. Custom controls can also be set, which is pretty much down to which buttons will and will not make your character jump, and there is an online leaderboard for the game's overall score which, unless you're one of those weird, awesome people, you probably won't get all that high up on. This game in the Vintage Collection boasts something special though - it retains the lock-on capabilities of the original, allowing access to the three extra games described in the Other Modes page. You need to have purchased and downloaded Sonic 1, 2 or 3 onto the console to gain access to their respective locked-on counterparts, via the "Bonus Content" option on the main menu. When you select one of them, each acts as the regular Vintage Collection games do, so they have their own menu to the side of their title screens in which you can set options and create and load a set of three game saves that are separate from the other unlockable games and the main S&K save files. They also have their own individual leaderboards, apart from Blue Sphere, whose original main menu and password entry interface has also been taken over by the generic menu system entirely. 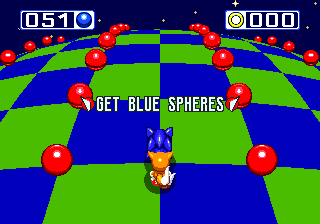 You can select your character and choose to jump to a particular Blue Sphere stage, via a code, either when you first start the game up or have just failed at a stage. If you succeed, you'll return to the original game's menu but will be locked out of doing anything other than starting the next stage. Lastly, there are 200 points available in Achievements on your Xbox Live Gamerscore. You can get 10 points for starting the game at least once as each character, and another 10 for entering a bonus stage, collecting 100 rings, or completing Mushroom Hill Zone. You get 15 points each when you first complete Flying Battery, Sandopolis and Lava Reef Zones, and another 15 for picking up your first Chaos Emerald. 25 points are given for earning your first continue, completing the game as Sonic, completing it as Knuckles, and the first time you acquire a first set of emeralds as either. I can confirm that the Sonic & Knuckles Collection runs well on Vista and Windows 7. They will however run the game insanely fast as you mentioned unless you make a small addition to the .ini file. Start a new game as either character and hop onto one of the handles of the large pump devices in Mushroom Hill Zone. While hanging on, press left, left, left, right, right, right, up, up, up. If done correctly, you'll hear a ring chime. Press start and then A to return to the title screen. There, select a character and hold A, then press start. You'll be taken to a similar level select menu to those seen in Sonic 2 and 3. Both Sonic 3 and S&K levels are listed in order, but of course, you can only access the S&K ones. Use the D-pad to select the zone and act, and start button to play, but choosing any Sonic 3 levels just takes you to Mushroom Hill Act 1. You will play as the character you selected on the title screen, but this can be changed in the level select by pressing the C button, which will alter the number that's just under Angel Island Zone in the menu. 00, 01 and 02 means Sonic, and 03 means Knuckles. You'll notice Lava Reef is mentioned twice, with 4 acts between them. Act 3 is the Lava Reef Act 2 boss, and Act 4 is Hidden Palace Zone. If you're set as Knuckles, then choosing either Sky Sanctuary Act 1 or The Doomsday Act 1 does nothing, and same for Sonic with Sky Sanctuary Act 2. Doomsday Act 2 takes you to the Final Boss, in Death Egg. You can actually play the entirety of Death Egg Zone as Knuckles, though the only thing he can't do because of his weak jump is defeat the Act 1 boss. Acts 1 and 2 of the Special Stage both take you to the first Special Stage, and you begin the game from Mushroom Hill thereafter. On the Sound test at the bottom right, press left and right to change the number and C to play the tune associated with it, while A skips ahead to the next set of numbers. This sound test is for both Sonic 3 and Sonic & Knuckles music, but none of the Sonic 3 ones play, so I guess they're not included on the S&K cartridge, whereas the S&K ones were on Sonic 3. When you're playing a level accessed through the level select menu, pause the game, and then press A to return to the title screen (where you can just hold A again while selecting a character to return to the level select), hold B to play in slow motion, and press C to advance the paused scene by one frame. Similar to the above. Go to Angel Island Zone as any character and grab hold of one of the swinging vines there. While swinging back and forth, press left, left, left, right, right, right, up, up, up. You'll hear a ring chime. Press start and then A to go back to the title screen where you'll find an additional Sound Test option, visible by pressing down twice, or up once. Select it, and you'll be taken to the same level select menu described above. Use the D-pad to select a zone and act and press start to play it. You can change your character using the C button, which changes the number on the top left of the screen, under Angel Island. 00 is Sonic and Tails, 01 is just Sonic, 02 is just Tails, and 03 is Knuckles. See above for all other details - the only difference is that obviously you can now select all of the Sonic 3 levels as well, and Special Stage Act 1 takes you to the Sonic 3 Special Stages, while Act 2 is for the Sonic & Knuckles ones. 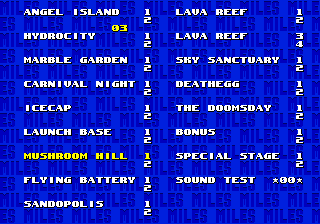 First, access the level select menu described above, and choose Mushroom Hill Zone. Like the S&K cheat, hop on a handle of a large pump device and press left, left, left, right, right, right, up, up, up. Press start, then A to return to the title screen, and access the level select menu once again just by choosing Sound Test. Now select any level and hold the A button while pressing start. You'll now be able to switch to debug mode when you press B (the score and timer will be all screwed up, but don't worry about that). This mode will allow you free roaming access across the whole level, and you can place any of the level's objects wherever you like (but if you go too far away and come back again, they'll disappear). Press A to change the selected object, B to alternate between debug and regular mode, and C to place an instance of the selected object. When not in debug mode, you can also reverse the gravity by pressing A. In addition, having entered the debug cheat successfully and returned to the level select, you can now go anywhere as anyone, so the barring of particular characters in the later acts no longer apply. This allows you to battle Super Mecha Sonic as Sonic or Tails in Sky Sanctuary Act 2, and see two of Knuckles in Act 1. Like Sonic 3 did, Sonic & Knuckles has a secret eighth Special Stage, and both are accessible in Sonic 3 & Knuckles. To get to them, enter the level select cheat above, and then the debug one as well. When you're back on the level select menu, go down to the Sound Test and set the number to 07, though you don't need to play it. After this, select either Special Stage 1 or Special Stage 2 and press start while holding A. Special Stage 1 takes you to Sonic 3's secret Special Stage (albeit with a blue and green colour scheme instead of two shades of blue), while 2 takes you to Sonic & Knuckles'. This mysterious eighth emerald is gold in colour. At the title screen, press up, up, up, down, down, down, left, right, left, right. A ring chime will tell you that you done good. Hold A and press start to access the level select menu, which is exactly the same as the regular Sonic 2 level select. Please see the cheats section of Sonic 2 for further info on this menu. Access the level select menu and get on over to the sound test on the bottom right. Use the right/left and C buttons to select and play the following sequence of numbers: 1, 9, 9, 4, 1, 0, 1, 8. 10th October 1994 being S&K's release date. You'll hear that good 'ol ring chime again when done correctly. Pick a level and hold A, then press start to begin. Usual debug controls and rules apply, as described in the Sonic 2 cheats, or above, in the S3&K debug. 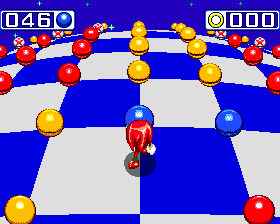 When in Debug mode as Knuckles in Sonic the Hedgehog 2, when you turn into and place television item boxes, instead of getting the teleport one like you did in Sonic 2, they are 10-ring boxes so you can have an easier endless supply of rings and it also helps with collecting chaos emeralds. The 7 emeralds cheat for Knuckles in Sonic 2 is 1, 6, 7, 7, 7, 2, 1, 6! Super Knuckles cheat is 1, 6, 7, 7, 7, 2, 1, 6!!! In S3&K, the monitors are a little bit different. They all have an "S" on them. Destroying it gives you hyper powers! I love S3 & K: Debug mode and the play as knukles!